The finest outdoor shelter on the market. Not to be confused with cheap mass produced soccer canopies. 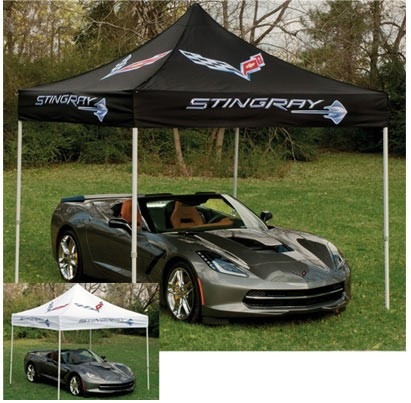 This Stingray Corvette canopy features a stunning full color Stingray logo print sublimated on all four sides. Heavy duty, industrial, powder-coated frame, that takes just seconds to open. No tools required - simply pull open with one or two people and lock into place. 100 square feet of instant shade. Four height adjustments to take the head height to 6' 11". The easy to use thumb buttons makes this frame easy for everyone. No more pinching or pulling the old style buttons. 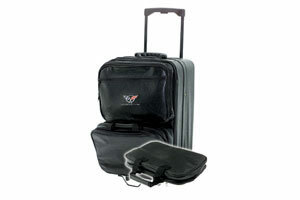 Compact and easy to store with the included heavy duty banana style roller bag. Unzip set it on the pad and zip shut, no pulling-over or lying on the ground to close. Includes stake kit, steel frame, foot and corners. Closed dimensions = 11" x 11" x 64". Specify white or black when ordering. 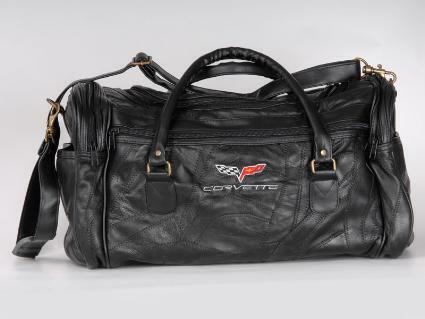 Corvette Leather Bag W/Either C4, C5 or C6 Logo !